After you have learnt the major 251 progression in all 12 keys it’s time to learn the minor 251 progression. Minor harmony is much more complex than major harmony and it takes more time and patience to master. You will encounter a problem when you try to build the 2, 5 and 1 chords out of the natural minor scale. This is because the 5 chord in the natural minor scale is minor in quality and this creates a very weak sense of resolution from the 5 chord to the 1 chord in the progression. This is where the Harmonic Minor Scale comes into play. 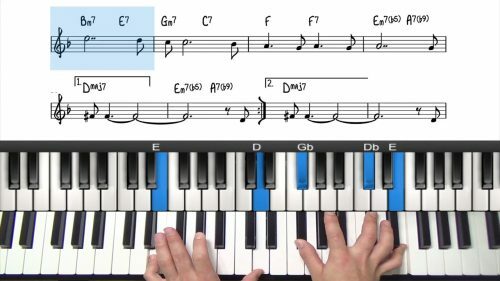 If this sounds new to you, you should make sure you are familiar with the different types of minor scales and their uses and application in jazz piano. You will encounter a problem when you try to build the 2, 5 and 1 chords out of the natural minor scale. This is because the 5 chord in the natural minor scale is minor in quality and this creates a very weak sense of resolution from the 5 chord to the 1 chord in the progression. We learnt in the lesson on the Major 251 Progression that the 5 chord must be dominant — this is where the Harmonic Minor Scale comes into play. The harmonic minor scale is used to create more interesting harmonies in minor keys. To construct the harmonic minor scale, we take the natural minor scale and we raise the 7th note by half a step. So in the key of C we take the Bb and we raise it to B. The harmonic minor scale has a middle-eastern quality at the top of the scale which gives it a very distinctive sound. To build a minor 251 progression, the 5 chord comes from the harmonic minor scale of the key you are in. The 5 chord from the harmonic minor scale is always dominant in quality which creates a very strong sense of resolution to the 1 chord in the 251 progression. What Changes in the Harmonic Minor Scale? Now that we have raised the 7th note of the scale, we now have 4 different chords in the scale. We have already talked about the 5 chord so now let’s look at the other 3. The 1 chord was a minor 7th chord in the natural minor scale, now that the minor 7th has been raised this creates a minor-major chord. You may not have come across minor major chords but as the name suggests they are a cross between minor and major chords and contain a minor 3rd and a major 7th. The next chord that changes is the chord built of the 3rd degree. We did have an Eb major 7th chord in the natural minor scale, but now the 5th has been raised which creates an Eb augmented chord. An augment 7th chord is the same as a major 7th but the 5th has been raised by half a step. Finally, the last chord that changes is the chord built off the 7th degree of the scale. In the natural minor scale this was a Bb7 chord but now that the 7th note of the scale has been raised we now have a B diminished chord. 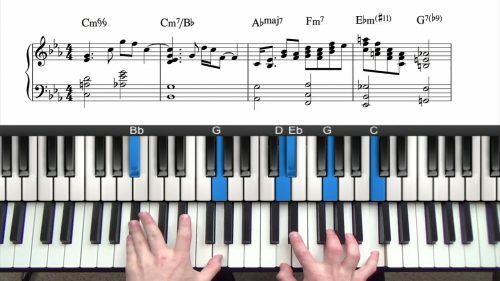 Diminished chords create a greater sense of resolution from 7 to 1 in minor keys. The 2 chord in a minor 251 progression is always a minor 7 b5 chord. Minor 7 flat 5 chords are also known as half diminished chords and both terms refer to the same thing. This chord is built of the 2nd degree of the harmonic minor scale which makes it the 2 chord in a minor 251 progression. This is where things get a little bit more complicated. The 5 chord in a minor 251 progression is always an altered dominant chord. An altered dominant chord is a dominant chord where the upper extensions of the chord have been raised or lowered by half a step. 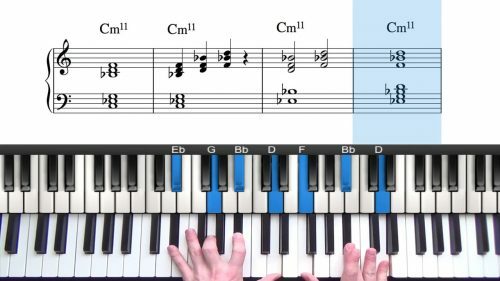 These alterations create extra dissonance and tension on the 5 chord and create a greater sense of resolution to the 1 chord in the progression. Finally, we have the 1 chord. You have three options here. The first is a normal minor 7th chord — the Bb isn’t actually in the key of C harmonic minor but you can still play that chord and it will still sound good. The second option in a minor major chord — this is the diatonic 7th chord built of the 1st degree of C harmonic minor. The third option is a minor 6th chord — here we have the root, 3rd, 5th and 6th — again, the A natural isn’t in the key of C Harmonic minor but you can use this chord. The concepts we’ll be focusing on are target notes, approach patterns and chromaticism. Understanding these principles will give you line structure. My Funny Valentine is a difficult standard to learn. In this lesson we breakdown the complicated chord changes and build a solo arrangement. The trick with learning minor 251s is to visualize the starting position, if you can find that the rest of the progression will fall into place. For the 2 chord we have A-7b5, if we move it into the 1st or 3rd inversion - all we need to do is move the top or bottom 2 notes a half step in either direction and then you will be playing the V chord with a b9 and a #5 or b13. This relationship works in any key, so if you know your -7b5 chord inversions, you have the formula to build every minor 251 progression. Make sure that you are always analyzing and identifying the scale degrees that you are playing and you will gradually build a strong awareness of where these altered tones are located. The downloads will help you work out the notes but don’t become over reliant on the notation.